An often overlooked gem from the not so distant past, I stumbled on The Last Scandal Of My Life (2008) while surfing the web for information on another show. I read the synopsis and thought to myself, "This sounds like it'll be really funny and different, concentrating on middle aged people for a change instead of young people" and so I abandoned the other show I was going to watch and started this one instead. I laughed so hard, especially in the first two episodes, that my sides literally ached. The lead actress, Choi Jin Sil (Star In My Heart), and lead actor, Jung Joon Ho (IRIS, Queen Of Reversals), had sublime chemistry together and played off one another perfectly, playing former high school sweethearts who lost touch with one another for twenty years and then run into each other again during a stormy period in both their lives. The actress, highly respected in the industry for twenty years, had personally requested that Joon Ho play this part, and I'm glad she did because it's the best performance I've seen from him so far. Sadly, however, Jin Sil committed suicide only a few months after this show was completed, and only one month before a sequel was planned because the first show had proved so successful, topping out at 19.5% Nielsen ratings. Therefore the title of this Korean drama is forlornly prophetic -- her personal life had had its share of scandals -- including being beaten up by her baseball player husband which resulted in a high profile divorce -- and this show ended up being the last one she would ever make. I loved watching her act, she was completely endearing and feisty in this role. I dedicate this page in her memory. 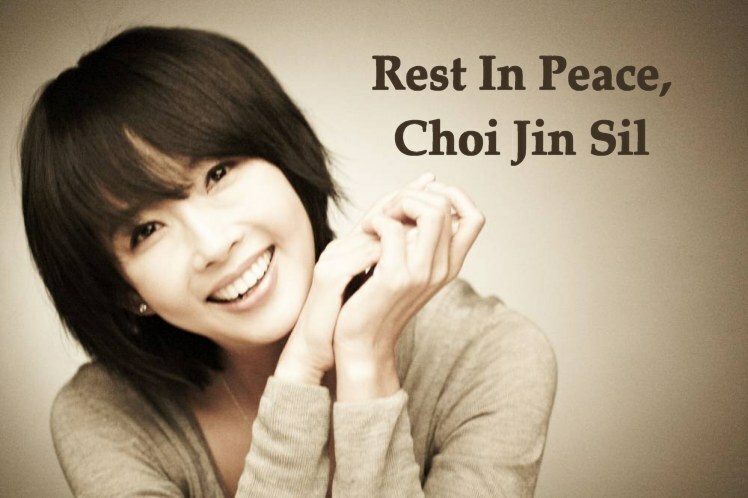 There is a good reason she was dubbed "The Nation's Actress". The camera loved her. She communicated so much through her eyes and body language that words weren't always necessary to know what her character was feeling or thinking. The Story: Hong Sun Hee, nicknamed "Sunny" (Choi Jin Sil), is a 39 year old frazzled housewife facing financial difficulties due to her errant husband Ahn Yoo Shik's (Kim Byung Se) mounting debts and secret womanizing ways. He disappears for long stretches, and Sun Hee has no idea where he is. She essentially lives alone with her precocious teenage daughter Jimin (Han Bo Bae) and puts up a brave front, finding part time jobs any way she can, whether cleaning houses or even being part of an audience laugh track recording at a local television station. Because of her constant financial worries she has let her personal appearance go to pot: her hair is a mess, she wears thick glasses, she dons unbecoming clothing, etc. She later learns that her husband has taken up with a rich woman and she plans to file for divorce from him to start a new life, which means eventually cleaning herself up and making herself attractive again. It's quite an interesting process. One day Sunny literally bumps into famous actor Song Jae Bin (Jung Joon Ho) at a commercial shoot, and he turns out to be none other than her first boyfriend in high school, whose real, non-stage name was / is Jang Dong Chul. They look at each other and are temporarily shocked. "Could this possibly be ....?" "No, no way!" Sunny had once been the prettiest girl in high school, but Jae Bin does not think this frumpy "Ahjumma" (older woman in Korean) could possibly be the same girl he had once loved. Later the same day Sunny spots her own daughter Jimin talking to the actor and laughing and she is furious with this man, thinking he must be flirting with her underage daughter! She goes in for a physical attack against him. He can't ignore that! He has to find out who she is and confirm her identity once and for all. When he confirms her identity he is flabbergasted to realize that his first love is so radically changed; he is embarrassed by her now and seeks to avoid her, which only causes her to get her dander up even more, to confront him again. She sure has realized who he is by now! Does he have any concept how difficult her life has been for twenty years? While he was becoming a rich and successful actor she was struggling to put food on the table. How dare he judge her? The famous drama star is not without his own problems, but only of his own making -- he's not a victim of another person like Sunny has been. To maintain his popularity as he gets older, he has deceived everyone about his true age, his true family background, and even his real name. Sunny poses a threat because she knows all about his past and if she wanted to she could alert the press and reveal his lies. In return tor keeping her mouth shut about his private life and history, Jae Bin offers Sunny a job at his luxury apartment as a maid, and she and her daughter Jimin can also watch over his young nephew Jang Hoon (Lee In Sung from Spring Waltz), son of his older brother / professional manager Dong Hwa (actor Jung Woong In, who played the infamous evil killer Joon Gook in I Hear Your Voice -- it was nice to see him play a good guy for a change!) who also lives with Jae Bin. This is going to be one big cozy "family", isn't it? Jae Bin's brother Dong Hwa is estranged from the boy's mother, Lee Na Yoon (Byun Jung Soo from The Manny), he's lonely, and soon starts to grow secret romantic feelings for the new maid who is taking care of the household and his son so well. playing father and son - at first! At first Jae Bin likes to tease Sunny all the time. However, eventually he finds himself growing jealous when Sunny gets along with Dong Hwa so well, who is the opposite of himself: gentle, kind, even-tempered and mature. Jae Bin keeps recalling how beautiful Sunny was when they first fell in love with each other twenty years earlier. More and more he feels happy and relaxed with her, since he can just be himself when he's with her, and not have to play the famous arrogant actor routine. He is rediscovering his true self with her. She is direct, honest, sometimes shy but forceful when required. It's always nice to watch a character transform in a drama to become a stronger and more confident person. When this happens with Sunny it in turn mellows Jae Bin as well. Jae Bin finally realizes he has fallen in love with Sunny once again. He starts to buy her little gifts to show his renewed affection for her. Then a big gift: he pays for laser surgery for her eyes so she no longer needs thick glasses. She is changing into a princess, a "Cinderella Ahjumma", so to speak, as Jae Bin transforms into a prince! Ahjummas deserve to be happy too! However, there are some things neither Jae Bin or Dong Hwa can help her with, and that's her emotional scars having to deal with her ex-husband. She will have to deal with those mostly on her own, depending on her new strengths as a desirable, attractive, more confident woman. There are also some jealous confrontations between the two brothers, since both have fallen in love with the sweet Sunny. There are also new secrets to be revealed about a particular family issue having to do with young Hoon's real parentage. Eventually the paparazzi begin to catch on to the truths of Jae Bin's intense family situation and history and possible romance with his maid, and they start stalking the actor and Sunny. Will Jae Bin be more concerned about his career being ruined by scandal, or the feelings of Sunny, the children, and his brother? Jae Bin had put his career first for two decades and it's hard breaking away from ingrained habits. His decision will prove his real mettle. Is he a man .... or a rat? This show has no objectionable material, unlike other K-dramas I've seen, and I think that's largely due to the influence of actress Choi Jin Sil to keep things family oriented and authentic. She wanted to make a show her own children could watch without any qualms. Whatever person or events in her life made her so depressed to take her life in October, 2008, should really have been revealed at the time of her funeral. Yet the horrible "husband" showed up at the funeral all tears for the cameras. A year and a half later her brother, also an actor, committed suicide too! Too many actors and celebrities in Korea choose suicide as an escape from their problems and fears. I hope she is at peace where she is now because I was so touched by her deeply emotional performance in The Last Scandal Of My Life. All this character wanted was a simple family life. I would have loved to have seen that sequel to the show, but now it will never be. What a loss to her fans, family, friends, and co-workers. Enjoy. Don't miss this often neglected K-drama. It is nice to see such a well written show about how people come together to form a second family after divorce. Everyone's performances were spot on, and often this feels like real life more than a television drama. That's a true measure of success to me. Always nice to have a wedding BEFORE the main couple become intimate!